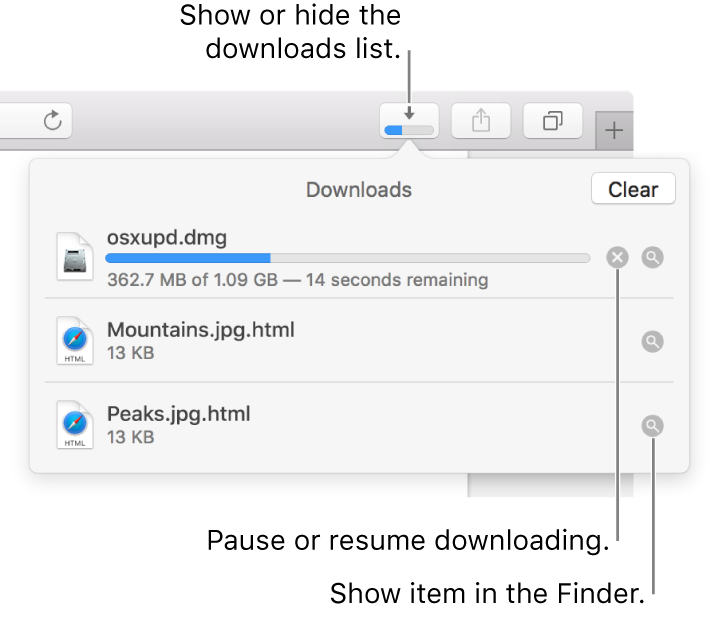 Safari can download most types of files, but if you have trouble with a file, try these suggestions. If Safari is still downloading the file, wait for it to finish. You can’t open a file while it’s being downloaded. If the download is paused, resume it. Show the downloads list by clicking the Show Downloads button , then click the Resume button for the paused download. If you see a message that the app can’t be opened because it’s from an unidentified developer or wasn’t downloaded from the Mac App Store, you can open the app by overriding the settings in Security & Privacy preferences. Sometimes a download is incomplete because the file was damaged. Try downloading it again. Make sure you have the app needed to open the file. If you do, the file may have been corrupted during the download. Delete it, then try downloading it again. The downloaded file may be a compressed archive or disk image that contains the file you want. If the file is from a trusted site, double-click it to decompress it. If the trouble began after you installed a Safari plug-in, you can disable or block the plug-in.